This question comes up all the time—“I ate something off-plan during my Whole30. Do I really need to start over?” Today, we’ll tackle the nuances of this question, and throw in a little of that famous Whole30 tough love. But this time, we’re doing something different… we’re using Gretchen Rubin’s Four Tendencies framework to speak to each and every one of you, giving you the specific advice YOU need to honor your commitment, maximize your Whole30 success, and solidify your new healthy habits. 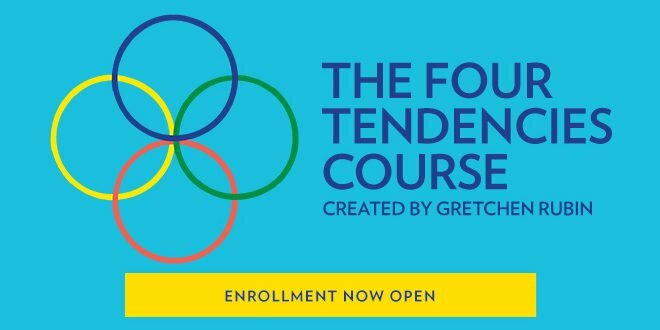 The Four Tendencies is a book and NEW video course by my friend Gretchen Rubin. The premise is simple: There’s no magic, one-size-fits-all answer for building a happier, healthier, more productive life. Understanding your Tendency (Upholder, Questioner, Obliger, or Rebel) will help you understand yourself and how you relate to others; gives you the tools you need to create habit-related behaviors that will actually work for you; and motivate change in your employees, clients, children, and community. Oh—and if you don’t know your Tendency yet, that’s okay! Read through the post and see if one section connects with you more than the other, than enroll in Gretchen’s new video course to confirm your Tendency and learn about how to make it work for you. Do I REALLY need to start my #Whole30 over? From a #FourTendencies perspective. Which brings us back to the question at hand: If you eat something off-plan during your Whole30, do you really have to start over? It’s clear right in the Whole30 program rules: No slips, no cheats, no special occasions. The program requires 30 straight days of 100% compliance, otherwise, it’s back to Day 1 for you. There, wasn’t that easy? 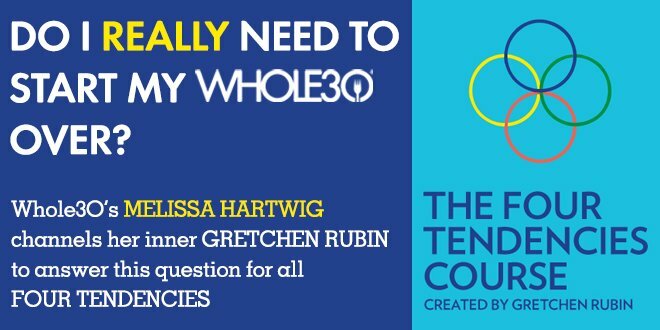 This will appeal to the Questioners: The Whole30 is at its heart an elimination diet, designed to help identify food sensitivities and intolerances. All elimination diets instruct you to completely remove the potentially problematic foods for a set period of time. Without the complete removal, your body won’t experience what life is really like without these triggers, and you won’t be able to compare your experience when you reintroduce. You may think one beer or one piece of pizza won’t really make a difference, but if you’re sensitive to these foods, you require only a tiny amount to break the Whole30 “reset”—to disrupt the gut, fire up the immune system, and potentially trigger the symptoms of your condition. Remember, the point of elimination is full elimination. Now, you might say, “But if I was sensitive, I’d know it.” Uh, no. You would not. Nobody knows they’re sensitive until something happens to make them realize they’re sensitive. We know Celiacs who walked around eating bread for decades before they realized there was a problem. The point of the Whole30 is to identify sensitivities; foods that are having a negative impact on your body, brain, and quality of life in sneaky ways you’ve never tied back to your diet. So until you’ve done the full Whole30 by the books (which means 100% compliance for a full 30 days), you simply can’t make the connection for yourself. This is especially true of grains (especially gluten), dairy products, soy, peanuts, artificial sweeteners, and alcohol… but admittedly, doesn’t hold up as well with added natural sugars, “treats” made with technically-Whole30 ingredients, or stepping on the scale. Read the rest… then see #5. If you make an off-plan choice during the 30 days, start over, Upholders. Because you said you would. Because you owe it to yourself. Because you deserve it. Because the sense of self-efficacy that comes with tackling something as daunting as the Whole30 will spill over into all of the other areas of your life, setting off a good-health-be-good-to-yourself chain reaction that never, ever has to end. Start over because you demand better from yourself, and you love yourself enough to make it happen. And for the Obligers… You also made a commitment to others, whether you realized that or not. When you announced it on social media, told your family you were doing the Whole30, or joined an online or work group doing the program, you signed up for external accountability. From your spouse, because you told them you wanted to be healthier for your family. From your kids, because you told them you wanted more energy and patience. From your online community, counting on you for camaraderie and support. From the Whole30 team, who is checking posts daily to make sure people are on track to reach their goals. Even if you’re the only one in your social circle doing the Whole30, you’re not only doing this for yourself, you’re doing it for the people in your life who matter, so you can be the best version of you for them. And you owe it to all of them to honor that commitment. Oh, Rebels… we’re NOT going to tell you to start over, because no matter what, you’re gonna do what you want to do. But we will say this… copping out halfway through the program is the easy way out, and when have you ever flocked with the sheep? Remind yourself why you started doing the Whole30 in the first place–because you respect your body more than today’s fast-food, convenience-driven, “busy, stressed, tired” culture, because you won’t let yourself be controlled by coffee-sugar-carbs, because you LIKE standing up for yourself at happy hour with a glass of sparkling water and lime in your hand. Don’t start over because we told you to. Start over because most people won’t, and you’re not most people. Start over, don’t start over… it’s always up to you. We’re going to give you our best recommendations based on science and our vast experience, but no one is going to come to your house to check up on you, and no one is monitoring your Whole30 Day by Day to make sure you check the right box. If you ask me on social media if you should start over because of whatever rule violation, for the above reasons, I will always tell you yes, because my job is to give you the best advice I can. But this decision (like the consequences) are always yours and yours alone. One last note. If you find you’re one of those people who are always starting over—you just can’t seem to make it past Day 3—read this article to get past whatever physical or emotional hurdle is holding you back, and consider extra accountability from Whole30 Day by Day or working with a Whole30 Certified Coach. 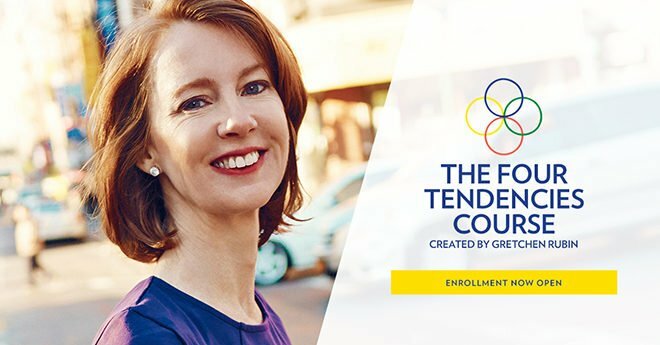 Enroll in Gretchen Rubin’s NEW Four Tendencies course ONLY through Wednesday May 9th. For more information, click here. Some of the links in this post are affiliate links, which means we make a small commission when you purchase through them. We only recommend those products and services we love and use ourselves. Thank you for supporting our Whole30 partners.